I am so behind on recipes I want to share, but can we talk about truffles for just a minute? First up, an old favorite – The Chocolate Fetish. My husband and I visited The Chocolate Fetish on our previous two visits to Asheville. Obviously they’re doing something right because we keep coming back for more! They’ve also doubled the size of their store since our last visit, so we’re not the only ones who think so. On this visit we picked up a bag of dark chocolate covered pretzels (the perfect salty sweet snack) and a box of 8 truffles. 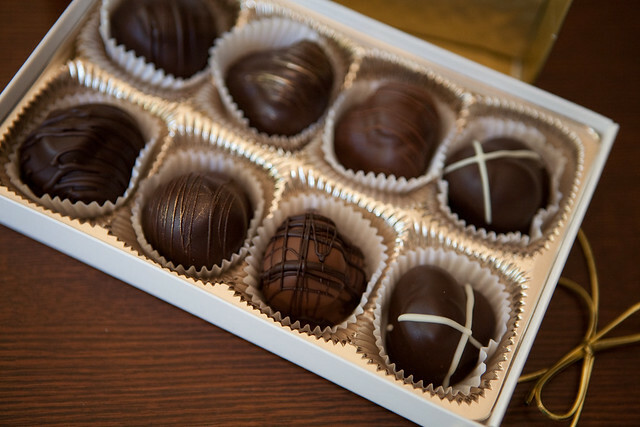 The Chocolate Fetish truffles are generously sized and expertly crafted. Each one has a rich chocolate shell that cracks when you bite into it, revealing a silky smooth ganache center. Truffle flavors pictured above: velvet sin, champagne, high tea, mocha magic, and mid-summer dream. See those last two truffles on the right, with the white chocolate criss cross? That’s the mid-summer dream, featuring lavender, lemon zest and honey. They are out-of-this world good and unlike any other truffle I’ve ever tried. They’re new and don’t seem to be available online, but if you see them in the store you need to buy one. As if that weren’t enough chocolate, we also visited the newly opened (since we last visited Asheville) French Broad Chocolate Lounge. Chocolate lounge? Those are two words that belong together. The atmosphere at the French Broad Chocolate Lounge is half coffee shop and half bakery. Warm sunlight filters through the large windows at one end of the shop, highlighting the the marble-topped tables, cake stands proudly guarding chocolate cakes, and a large case of seemingly endless truffles. Oh, and the menu? 99% chocolate. Chocolate truffles, drinks, pastries, cakes, cookies, mousse, brownies… basically if you can make it with chocolate, it’s on the menu. They also feature a local cheese plate which I am very sad to say I did not try. 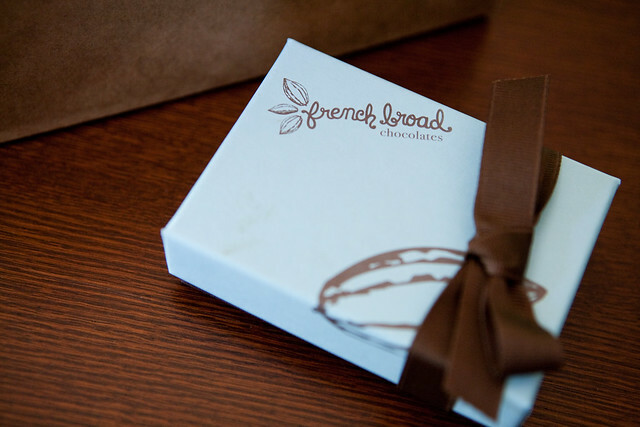 The first thing we tried at the French Broad Chocolate Lounge was the Cold Sipping Chocolate. It was thick, creamy, cool and rich, almost like a cold version of hot chocolate. Of course we couldn’t leave without trying a few truffles too. You may have noticed there are only 4 truffles in the photo from the box of 6 we bought. About those other two… well, I only have so much self control. These truffles are smaller than the Chocolate Fetish truffles, but they pack a wallop of flavor and are equally satisfying. We purchased the following flavors: maple with smoked sea salt, vanilla bourbon, fresh raspberry, earl grey, buddha, and fig & port. My favorite? Well if you read this blog you’ll guess it – the vanilla bourbon. It had just enough bourbon for the flavor to come through without overwhelming the chocolate. I could eat a whole box of them. At once. 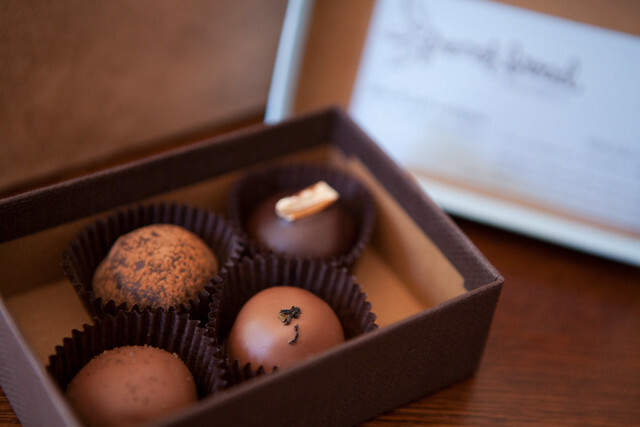 So there you have it – your personal hand-made truffle tour of Asheville, NC. These two chocolate shops did not ask for nor compensate me in any way for these rave reviews – I just love their chocolates and wanted to share them with you. Both companies sell their goods online and make excellent gifts! Thank you for visiting with us in Asheville again. We are working on offering some of our new truffle flavors on the website soon. Each flavor we develop represents weeks of testing to achieve the right balance in the ganache. As you can imagine, it is very hard work. We appreciate your review. You have a nice blog here and we look forward to reading more of you culinary adventures. I’ve actually never had a truffle before! Those look fantastic, though. Looks like they would make a nice Christmas gifts, too.